The newest and most popular type of 5K currently in the United States are the colorful 5Ks. These 5Ks include shots of harmless colored powder at various spots during the race. Although these types of races are not for serious training, they are a fun way to get out and experience a different type of 5K. Color Run, Graffiti Runs, and Color Me Rad are sweeping the nation. Many people who have never considered hitting the pavement before are signing up for their first 5K and getting out and participating in these races. If you’re looking for a competitive race you’re in the wrong arena, but if you want to get out, finish a 5K and have a great time, then this is the type of race for you. Although there are many different versions of this race, Graffiti Run, Color Me Rad and The Color Run, are the most well-known. Graffiti Run encourages runners to show up in all white, and to be creative. As you run the 5K you enter “graffiti zones” where you are sprayed with a different color in each zone, with a grand finale at the finish line. The Color Run, the largest 5K series in the nation, also shares the Graffiti Run’s fun attitude. Color Run participants can expect to become more colorful at each kilometer and enjoy a “color festival” at the end. The Color Run boasts no winners and no official times. 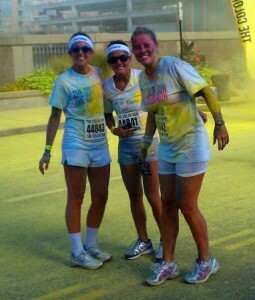 Color Me Rad has not quite had the turnout of other races, but still is a fun experience for those involved. Color Me Rad may be better if you aren’t as comfortable with huge crowds (one Color Run had 25,000 participants). If you are more serious about getting a workout, you may be better off with Color Me Rad or the Graffiti Run so you can weave in and out of people easier than the huge crowds of The Color Run. An added bonus of The Color Run, Graffiti Run and Color Me Rad is that they all donate a portion of their proceeds to a local charity in each city that they visit. For Color Runs, Color Me Rad or Graffiti Runs in your area, check out their websites at www.thegraffitirun.com, www.colormerad.com, or www.thecolorrun.com.